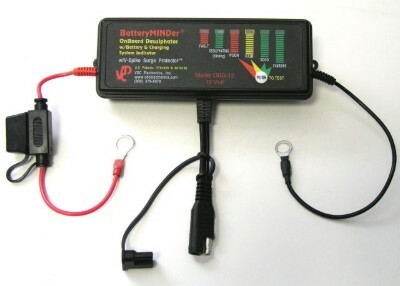 Battery MINDer Model OBD-12 Battery tester/desulfator activates when charging your batteries from an converter/charger, alternator, solar array, generator, or other power source. 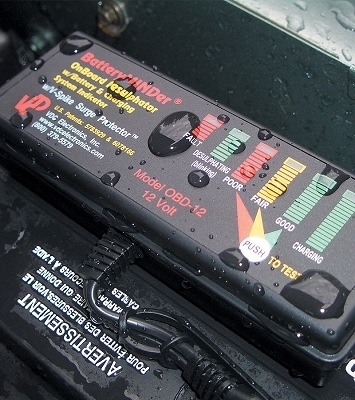 Quick connector input allows for easy use of additional BatteryMINDer charger / maintainer devices. Built in battery tester indicators show battery condition. Patented full-time high frequency sweep pulse desulfation is designed to reverse and eliminate battery sulfation, the #1 cause of early battery failure. 3’ DC cord with ring terminals, 3" DC input with quick connector (SAE). 1 year 100% money back guarantee, 5 year “no hassle” warranty. *Including but not limited to: Flooded (filler cap / maintenance-free / VRLA / SLA), gel, AGM (Optima / Odyssey / etc), starter, deep cycle and hybrid.